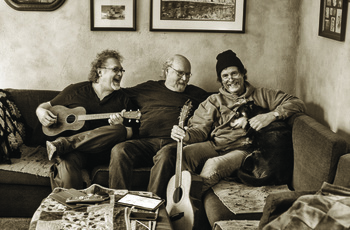 Grammy Lifetime Achievement Award winner and folk icon, Tom Paxton, teams up with the Grammy winning singer/songwriter duo The DonJuans — Don Henry & Jon Vezner. Collectively, their songs have been covered by: Harry Belafonte, John Mellencamp, Miranda Lambert, Neil Diamond, Ray Charles, Nancy Griffith, Judy Collins, Pete Seeger, Janis Ian, Kathy Mattea, John Denver, Faith Hill, B.J. Thomas, Blake Shelton, Peter, Paul & Mary and Bob Dylan… just to name a few! Within days of writing and playing together, they knew they were onto something. Now they’re taking it on the road! Tom on guitar/vocals/stories, Don on guitar/vocals/uke/banjo/grins, Jon on piano/vocals/guitar/uke/kitchen sink. After 56 years of performing around the world and writing and recording innumerable songs and recordings, Tom Paxton has found yet another outlet for his creativity; he has joined his friends and song-writing colleagues Jon Vezner and Don Henry –– known collectively as The DonJuans –– in a writing and performing experience calculated to keep them too busy to get into trouble. A trembling world awaits the results. Tom's career has taken him from his days as a drama student at The University of Oklahoma to thousands of concerts in a variety of venues –– from coffee houses in Greenwich Village to The Albert Hall in London to Carnegie Hall in New York; from festivals in Hong Kong to Denmark, from Tokyo to Oslo. He has done over 50 concert tours of England, Wales, Scotland and Ireland and has recorded over 50 albums of his own songs. Recordings of his songs by other artists number in the hundreds and include artists such as Bob Dylan, Johnny Cash, Willie Nelson, Dolly Parton, Judy Collins, John Denver, Joan Baez and Peter, Paul & Mary, to name just a very few. He began his performing career in Greenwich Village in 1960, coming in on weekends from Fort Dix, New Jersey, where he was toiling away in the Clerk Typist School. (He used his typewriter one day to compose his famous song for children, The Marvelous Toy, later a hit for The Chad Mitchell Trio and Peter, Paul & Mary). Upon his release he stayed in New York and put in several years playing in now-legendary coffee houses like The Gaslight and befriending other singers like Dave Van Ronk (The Mayor of Macdougal Street), Bob Dylan, Phil Ochs and Eric Andersen. His shows with The DonJuans have him on his toes, he says; "These guys are long-ball hitters and if I don't want to get smoked I'd better do a little rehearsing. I probably need to do that anyway," he says, laughing. "It certainly couldn't hurt." Grammy award-winning songwriter, Nashville-based Jon Vezner is a tunesmith of rare sensitivity and dry wit. His catalogue of recorded songs, topped by the poignant “Where’ve You Been,” reflects his straight-to-the-heart sensibility and emotional awareness. Vezner weaves the particulars of his own feelings with the lives of people he has known into universal themes that deeply touch listeners’ emotions. Vezner was honored with a Grammy for “Best Country Song” and the Nashville Songwriters Association “Song of the Year” in 1990, for “Where’ve You Been” — the true story of Vezner’s grandparents — co-written with Don Henry, and recorded by Kathy Mattea. “Where’ve You Been” was also honored as “Song of the Year” by the Country Music Association (CMA) and the Academy of Country Music (ACM). Jon was also voted “Songwriter of the Year” by the Nashville Songwriters Association International. Jon’s catalogue of songs reads like a songbook itself, interpreted and recorded by some of the greats in the business such as Martina McBride, Reba McEntire, Faith Hill, Steve Wariner, The Wiggins, Clay Walker, Diamond Rio, BJ Thomas, Janis Ian, John Mellencamp, Nancy Griffith, Judy Collins, and Native American recording artist, Bill Miller, to name a few. Jon’s production credits include artists such as Danny O’Keefe, Victoria Shaw, and singing legend Patti Page. In Morgan Hill, California in the early 70's, records like "The Band" by The Band and "Honky Chateau" by Elton John prompted Don Henry to begin writing his own lyrics to Jim Croce melodies. Then he learned to play guitar with a Paul Simon songbook. After that it was an education in The Beatles, Cat Stevens, Harry Nilsson, Carole King, Cat Stevens, and Joni Mitchell. Then Randy Newman's 'Good Old Boys' and 'Old Number One' by Guy Clark changed his life. In April of 1979, at 19, Don made his way to Nashville. After spending four years as the tape copy/librarian for Tree Publishing Company, cataloging some of the best songs by some of the best songwriters in Nashville (Sonny Throckmorton, Bobby Braddock, Harlan Howard, and Curly Putman), Don's own songs started getting recorded and he was moved to full-time staff songwriter. Ray Charles, Conway Twitty, the Oak Ridge Boys, T.G. Sheppard, John Conlee and Kathy Mattea are just a few who recorded Don's songs during this period. In 1990, Don and Jon Vezner received song of the year awards for co-writing Mattea's critically acclaimed hit, "Where've You Been.” Awards from the Grammys, as well as from the Academy of Country Music, the Country Music Association, and the Nashville Songwriters Association International culminated it "Where've You Been" becoming the first song ever to be so honored by all four organizations. In 1991 “Wild In The Backyard” was released on Sony/Epic Records. Billboard's Ken Schlager chose the debut album as one of 1991's Top Ten records, as did Larry McClain of BAM magazine. Rolling Stone liked it enough to profile Don in their "New Faces" column. So come step into the minds and the music of Tom Paxton, Don Henry, and Jon Vezner!